How Do You Measure Tread Depth on Your Tires? Slip a toonie in between your tread blocks. If the tread reaches the bear’s paws, your tires have lots of tread left (they’re probably new!). If the silver part of the toonie is covered by the tread block, your tires are about half worn. And if the tread reaches only as far as the letters (‘CANADA’ or ‘DOLLARS’), your tires are worn and need to be replaced. Your tires may also have built-in tread wear indicators. They’re little raised bars—usually six on each tire—along your tires grooves that mark the minimum permitted tread depth. If these indicators are worn, replace your tires right away. Tire tread depth gauges are a fast and easy way for you to know for sure if your tires are safe or if they need to be replaced. Tire tread depth gauges are available at most gas stations. Keep one in your glove compartment for easy access. Find the shallowest groove of the tread and insert the pin of the gauge until the base is flush with the tire. 6/32” Your tire’s tread depth is sufficient. 5/32” If wet roads are a concern, consider replacing your tires. 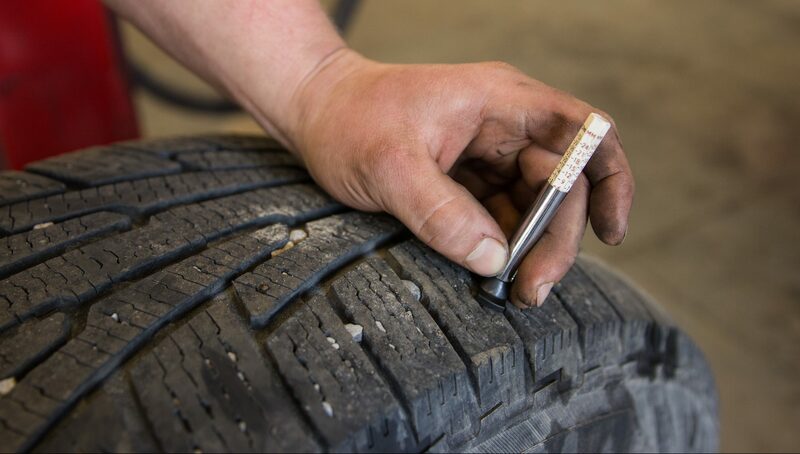 4/32” – 3/32” Seriously consider replacing your tires as soon as possible. 2/32” Your tires are legally bald and need to be replaced. 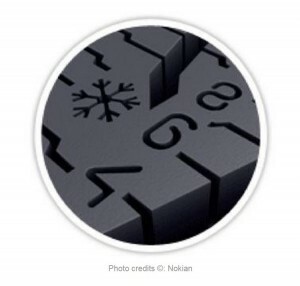 According to most manufacturers, and even the law in most provinces, your tires should be replaced when the tread depth reaches 4/32” in the winter and 2/32″ in the summer. If your tread depth wears to those levels, your tires are considered bald and a safety hazard. 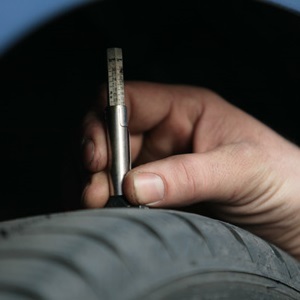 While you’re checking tread depth on your tires as part of your regular inspections, be sure to look for other signs of damage and aging, such as cracks, bulges or abrasions. If you want to be sure your tires are safe for everyday driving and road trips, have them inspected by the professionals at one of the many Kal Tire locations near you.